An excellent mechanism for rendering contrast in transparent specimens, differential interference contrast (DIC) microscopy is a beam-shearing interference system in which the reference beam is sheared by a minuscule amount, generally somewhat less than the diameter of an Airy disk. 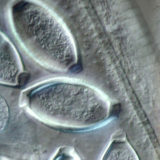 The technique produces a monochromatic shadow-cast image that effectively displays the gradient of optical paths for both high and low spatial frequencies present in the specimen. Those regions of the specimen where the optical paths increase along a reference direction appear brighter (or darker), while regions where the path differences decrease appear in reverse contrast. As the gradient of optical path difference grows steeper, image contrast is dramatically increased. 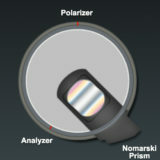 DIC with a fixed Nomarski prism and a simple de Sénarmont compensator. de Sénarmont compensators offer more accuracy for introduction of bias retardation. Examination of highly reflective specimens in DIC microscopy with epi-illumination. Explore the effects of varying bias retardation on specimen contrast. Examples of the same specimen viewed in either phase contrast or DIC. Variations in prism geometry yield unique interference patterns in polarized light. 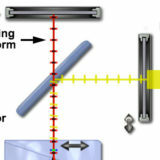 Optical sectioning of reflected light specimens (semiconductors). 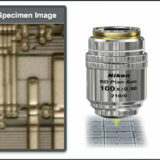 At high numerical apertures, DIC can be used for optical sectioning. 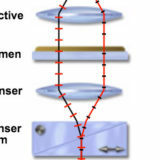 Observe how light waves travel through a reflected light DIC microscope. An interactive comparison of wavefronts in these complementary techniques. 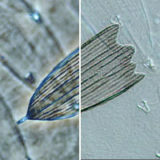 Compare specimen contrast using these complementary imaging techniques. 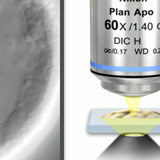 Contrast enhancement using interference of polarized light wavefronts. 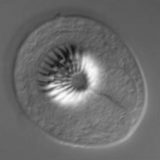 Edward D. Salmon - Department of Cell Biology, The University of North Carolina, Chapel Hill, North Carolina 27599.